I decided to wear my beautiful yellow Calvin Klein dress. I ♥ this dress. The moment I saw it, I knew I had to have it. So bought it. I mean, hello! 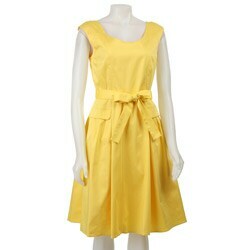 How can this sunshiney yellow dress not make you smile?!? So, I wore it to school today, hoping it would help me keep a smile on my face for the day and every time I got to glance down at my new ID badge. "That is the best dress ever! It is the perfect color; the yellow color is like sunshine! It looks great on you, it's so flattering with it's cute little belt. I love it! I absolutely love it! " I smiled and said "Thank you. It is my favorite." Random acts of kindness. We should all act out a little more.